The Silk Road (or Sichou zhi lu 絲綢之路) is a term coined in the late 19th century by a German scholar to describe the trade routes that connected the Middle East, Ancient India and the Mediterranean to China. It was not one singular route but rather a network of land routes and sea routes that made trade between empires possible. The story begins with Zhang Qian. This explorer and diplomat was sent by the Han Emperor Wudi to make ties with the Yuezhi people with whom the Han ruler hoped he could create a common alliance against pesky Xiongnu invaders. Zhang Qian was unsuccessful in his diplomacy but during his trip (which lasted over a decade) he managed to exchange silk for the first time outside China. This exchange created a hunger in the West for silk and kicked off the exchange and trade along the routes that would become the Silk Road. Read the full story Zhang Qian and the Opening of the Silk Road. Starting during the Han Dynasty (206BC - AD 220), silk was the major commodity being exported from China but it was along these routes that cultural, technological and agricultural innovations exchanged hands. For example, Buddhism spread through China along the Silk Road in the 1st century. There were many stops along the route that ended in Chang'an, the capital city of the Tang Dynasty (618-907) where the modern city of Xi'an now sits. Today, when "Silk Road" travel is mentioned, it conjures up images of camel caravans, desert landscapes and green oases. Travel along the modern-day Silk Road is some of the most rewarding travel I've had in my experience in China. The China Silk Road includes areas from modern-day Xi'an, north to Lanzhou in Gansu Province, through the Hexi Corridor to Dunhuang and then on to Xinjiang where the route divided into a northern and southern route around the Taklamakan Desert to reunite in Kashgar. The Silk Road then left [what is modern-day] China and crossed the Pamir Mountain range into Pakistan and Afghanistan. Taking a Silk Road tour can be a fascinating way to see and understand China's ancient history and ties with the rest of the world. I have done many trips along China's Silk Road. While you won't find tents flapping in caravanserai, there is much to see. Many archeological sites are well preserved and offer a glimpse of the art, knowledge and trade that flourished a thousand years ago. The Mogao Grottoes site in Dunhuang is perhaps the preeminent place to see the Buddhist art that spans centuries. The landscapes around the Taklamakan Desert including the Yadan Geological Site help to conjure the image of camel caravans and give you a true taste of what traders dealing with harsh desert weather had to deal with. 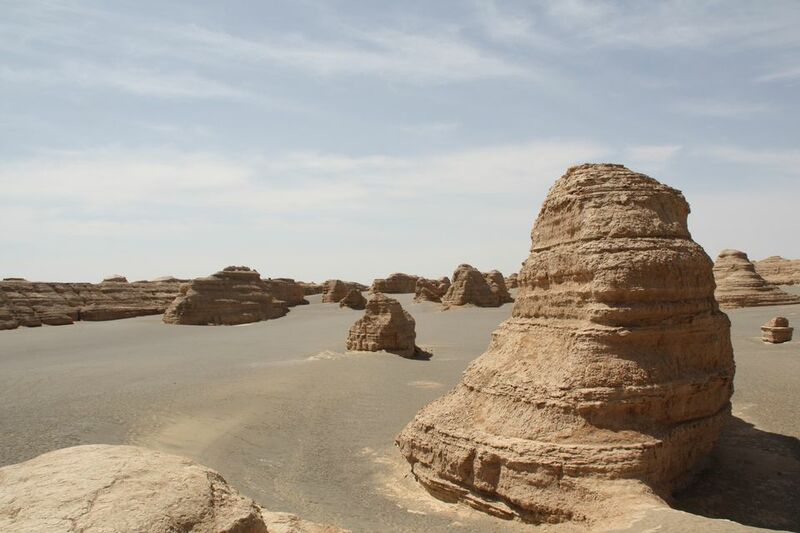 And the journey through the Hexi Corridor allows you to visit town by town ancient stops as you pass between two mountain ranges from Lanzhou to arrive at the edge of the Gobi Desert in Dunhuang. The Autonomous Region of Xinjiang holds many famous Silk Road sights. Travel around Kashgar, Urumqi and Turpan can give a Silk Road traveler many delights.